Magnetic Letters these letters are upper and lower case and come in a wooden box with a perspex sliding lid. The set contains two full alphabets of twenty six letters. The letters are brightly coloured and magnetic so they can used on the fridge or any metal surface. A great learning tool and a wonderful way to introduce letters. Size: Uppercase letters are 5cm by 4cm Lowercase 3.5cm by approx 4cm. The Box is 15cm by 15cm by 6cm. Material: Wood with coloured wipe clean card laminated surface, magnetic surface on back. We like this because: "Great way to introduce letters and they look nice on the fridge." 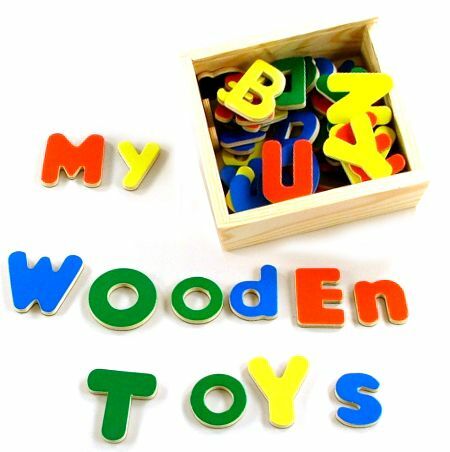 The quality and quick service from Wooden Toys is exceptional.